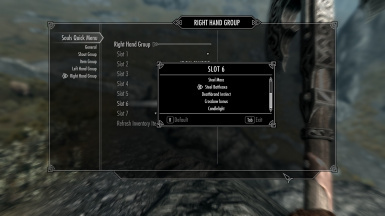 Adds a Dark Souls inspired quick menu into Skyrim, allowing the user to cycle through many weapons, spells, shouts, and potions in real-time. Please contact me before editing or changing any aspects of the mod. Special Thanks to the SkyUI team. This mod uses some of their assets and would not be possible without them. 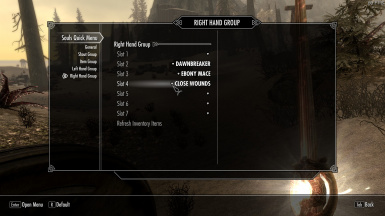 There are so many weapons, items, and spells in Skyrim that the player can become quickly overwhelmed and have difficulty managing them all. This becomes particularly noticeable in combat, when the player must pause the game to open the menu if the item or spell he or she needs isn’t bound to one of his 10 hotkeys (0 - 9)(In reality, I never use hotkeys past 7, really). Souls Quick Menu aims to reduce trips to the quick menu and thus increase the fluidity (and fun) of combat by making more items available using a cyclical queue. This mod more or less exports the item menu from Dark Souls into Skyrim. In Dark Souls, the user can never pause the game. This feature heightens suspense and forces the player to react quickly to changing combat situations, resulting in a challenging but rewarding experience. 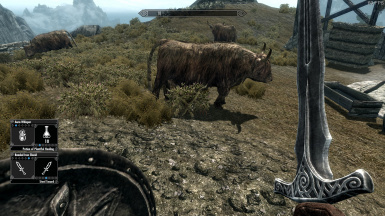 Hopefully, this mod will add some of these things to Skyrim by making combat less punctuated by constant trips to the menu system. Using my current playthrough as an example, I'll count the different spells and items I like to use regularly. I usually have 5 or more shouts I like to use regularly, like Ice Form, Aura Whisper, Become Ethereal, Unrelenting Force, and Whirlwind Sprint(5). My character uses a sword and shield, and I often swap between my Ebony Mace(6), which deals higher overall damage, and Dawnstar(7), which is effective against undead. I switch between two shields (9) and like to use torches when I'm in a dark dungeon(10). 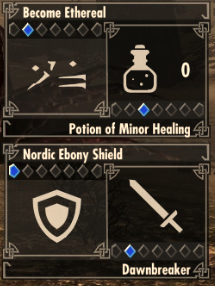 On top of this, I am specced restoration, and have a whole slew of healing and anti-undead spells I use frequently (close wounds, heal other, stendarr's aura, vampire's bane, circle of protection)(15). Finally, I use mana and stamina potions when necessary (17). A playstyle like this, where I use ~17 different items and spells regularly, makes for many trips to the quick menu. I'll bind my sword, shield, healing, and maybe a shout or two to hotkeys 1 - 6, but the rest I'll have to switch to by pausing the game and selecting in the quick menu. With Souls Quick Menu, I can use every single one of these options without having to pause the game. This video covers version 1.0. Some of the bugs have since been fixed and there are new features that are gone over in the V1.2 overview video. For those of you who do not want to watch the video, hopefully this will explain how to use the mod. 1. Go into the General MCM page. Toggle "Assignment mode" on the right side. 2. Assign hotkeys that will be used to assign items to your left, right, and shout slots. I used L, K, and semicolon, but anything works that isn't already assigned to an action. 3. Exit MCM and equip the items you want to assign. 4. Use the normal cycling hotkeys for each slot to move the active slot. While in assignment mode, the current slot gem will be red, not blue, and you will not equip the items in those slots. 5. Press the assignment hotkeys you chose in step 2. The weapon / spell / shout you have equipped will now bind to the currently active queue slot. 6. When done, go back into MCM to turn off assignment mode. 1.Go to the MCM Menu "Souls Quick Menu" and you will see there is a page for each of these slots. 2. On the page for each slot, you can choose what items to put in these queues and in what order. 3. Once you're done, exit MCM and press the cycling key (which can be set on the "General" page in MCM") for the corresponding slot and it will equip the next item in the queue. NOTE: There are some rules as to what items you can put in what slots. Two Handed Weapons, Bows, Crossbows may only be placed in the right hand queue. Finally, there is some logic to the mod that may not be immediately intuitive. For instance, if you equip a 2h weapon, it must unequip your left hand. If you then cycle your left hand queue, it will equip an item in your left hand which forcibly unequips your 2h weapon. This is not an error. Finally, this is my first mod ever and I did my best to remove all of the bugs. If you find any or have any problems, please post them here and I will try to fix them. If you have any trouble using the MCM drop down lists to assign items to your queues, please try assignment mode. It is much more reliable and should allow you to assign anything you want. *Added Feature: Assignment mode. After turning on assignment mode in the MCM menu, players can assign items to their queues based on what they have currently equipped in their hands and shout slot. This will hopefully solve any issues with players being unable to use weapons that don't show up in the MCM lists. *Added a "refresh potions only" button to the potions group MCM page. Since assignment mode can't be used to assign potions, I added this to make assigning potions slightly quicker. *Added Feature: Unarmed. Players can assign Unarmed 1H or Unarmed 2H to their queue slots through the MCM menu. Placeholder unarmed "weapon" items are added to the player's inventory for this to work. *Added fadeout feature. Users can elect to have the widget fade out when not in use. Special thanks to Dr. Brian Malloy and the SkyUI team for all of their help. This mod uses much of their code and is largely inspired by their work. It would not be possible without them.